12/11/2009Share this story on Facebook! This class investigates the relationship between mathematics and culture, particularly the mathematical ideas of those who live in traditional or small-scale cultures. Professor Pfaff covers descriptive statistical techniques, introduction to probability, statistical inference, correlation and regression analysis, and multiple regression. Data sets and exercises are chosen from the fields of business, economics, and management. Focus is on the underpinnings of and strategies for mathematical arguments that constitute mathematical proof. Students learn to employ these strategies and concepts to create basic mathematical proofs. Mathematics is a highly valued tool in today's world, combining quantitative thinking, formal reasoning, and creative problem-solving. As such, it’s terrific preparation for a variety of careers in business, industry, or government. Our program also prepares you for further study in math and many other fields, including statistics, operations research, actuarial science, and environmental engineering. 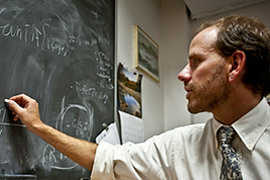 In independent study courses, Pfaff ’90 has been working with students to sort through data from the National Center for Atmospheric Research in order to create mathematical models of climate change. These models are applied to real-world situations, such as wine and maple syrup production. Riesling grapes require a number of cool nights at the end of the growing season; without them, quality may diminish. Meanwhile, other Old World vinifera grapes, like those used to make chardonnay and cabernet franc, could improve with warmer winter temperatures and a longer growing season. That information could help local wineries in deciding what crops to plant. It’s one of the many ways Pfaff integrates sustainability and real-world information into his teaching. Environmentally savvy and health conscious, Pfaff and his wife, Janice, grow their own produce, trying to harvest something from the ground every month: garlic, carrots, parsnips that survive ground freezes, greens grown in cold frames (a box placed over plants to protect them from freezing), berries, and quinces. In the corner of his office, right by the pictures of his four beaming boys, sits a commuter bicycle, its gears and chain rusty from the winter’s salt and moisture. “You really can bike in February around here,” Pfaff says, even though it has reduced the bike to just one useful gear and brake. Though it’s his ninth year at IC, only recently have colleagues begun to comment on the bike’s “fuel efficiency,” he says. For Pfaff, education is as much about gaining book knowledge as learning social responsibility. So he’s introducing math courses to the curriculum that you won’t find at any other school, like last fall’s Oil, Energy, and the Future of Society. 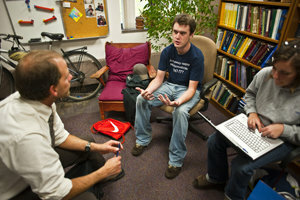 For a recent assignment, he had students analyze oil usage statistics from various sources for their credibility. “People have to have a solid understanding of why groups are concerned about climate change and about oil and coal use, so you have an educated population voting and making decisions,” Pfaff says.